Where can you stream Black Butler? 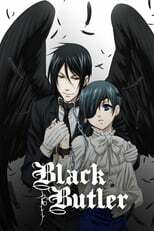 On 2008-10-02 Animation/Comedy TV Series Black Butler first aired on MBS. Written and created by Toshiya Shinohara & Hirofumi Ogura, and produced by Aniplex & A-1 Pictures, Black Butler has ended and last broadcasted on 2014-09-12.